‘Tis the season of Christmas tradition. I have to admit, a few weeks ago I was extremely stressed about trying to figure out exactly what traditions we wanted to have with our three daughters as they grow up. I love tradition for a lot of reasons. I love the memories from when I was a child of my sister and I opening matching Christmas pajamas every Christmas Eve. Or the way I would playing Barbies with her all day Christmas Eve to make the time pass so Christmas would come faster. I love remembering how my mom would read us Christmas stories before bed and once we were old enough we would all take turns. 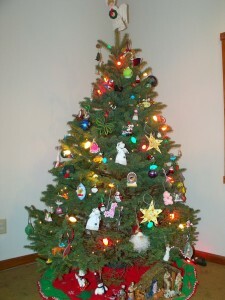 Or the way my dad would put up the lights on our tree every year and then us girls would decorate it. But, a funny thing happened when I got married. And, because of my ignorance I was surprised and caught off guard by it…. My husband’s family had different traditions then mine. They watched Christmas Vacation every year, they would light a candle on Christmas Eve while playing an Alabama song, and things were different; not bad, just different. My traditions didn’t mean as much to my husband and his traditions didn’t mean that much to me. I had never watched Christmas Vacation until I spent Christmas with my in-laws (I do like it now). I was strict about my traditions and didn’t want to give them up. My traditions from when I was a child are what made Christmas feel like Christmas to me. I was pretty much unwilling to let them go. It took me 7 years into our marriage to realize that I needed to let go and make new traditions with MY family; my husband and my children. I realized that it wasn’t fair to force Dustin to do all of my childhood traditions; we needed to make our own. So, I have tried the past few years to come up with some new traditions to start. Over the past few years we have tried a few different things: a new ornament for the kids each year, barbecue on Christmas Eve, getting our tree on a certain day of the year. And, you know what? None of them stuck. Tradition just isn’t something that you can force to happen. I think that you can choose to do something every year just by determination, but that doesn’t make it one of those traditions that you will fondly remember 20 years down the road. I have stressed since the beginning of November about what tradition to begin this year. I have brought the topic up over and over again with Dustin (he didn’t seem that worried about it), but we haven’t had any epiphanies about that perfect tradition. Finally one day while we were eating dinner I asked the girls what they like that we do at Christmas time, and through our conversation I realized that we have some traditions of our own: we do a Mickey Mouse Christmas countdown every year, we eat pizza for dinner the day we decorate our Christmas tree, we bake cut out cookies together, we decorate our tree together, on Christmas Eve before bed we read The Night Before Christmas and end with reading the story of Jesus’ birth and on Christmas morning we eat homemade cinnamon rolls. I realized that I got so caught up in trying to create perfect family traditions, making the Christmas village look just right, putting the decorations in all the right places, that I was missing the time that I could be spending enjoying the time with my family and showing them what Christmas is really about. 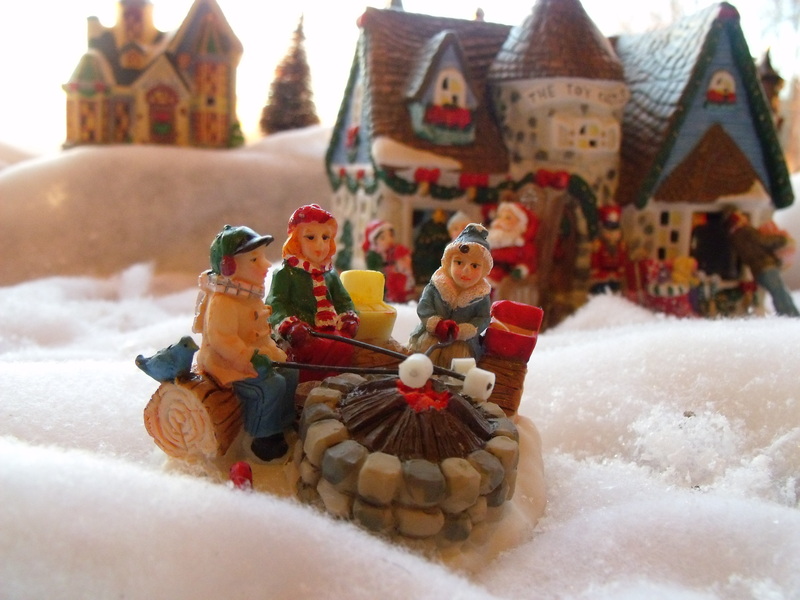 So this year, the kids having the bonfire from my Christmas village are up in front of the Toy Store instead of tucked back in the trees where “they should be” and the snowmen sneakily move around the house without me seeing. We enjoyed our pizza while looking at a beautifully decorated tree. I’m not sure where we will be or what we eat for Christmas Eve dinner, but I know that the girls will hear about Jesus being born and we will celebrate as a family. So this year, don’t worry so much about Christmas tradition. Enjoy the season with those close to you and remember what really matters. Now that we’re empty-nesters, our Christmas traditions are changing too. And ya know what?? I LIKE IT! We’re more focused on the season itself than we’ve ever been before. Gifts have been scaled down, decorations have been scaled down and true meaning has been brought back to the forefront. Kudos to you for finding your new Christmas traditions! Good for you guys! It’s so much more enjoyable when I’m not running around crazy trying to make it “feel” like the holidays! Your ranch is beautiful, I was just showing my husband pictures from your site this morning. I dream of having something like that in the future and having our everyday life pace slow down as well! This post sounds like what I’ve experienced too! The things my kids ask to do year after year aren’t the “traditions” I was trying to start. I’m happy though that they’ve found tradition in the things we do and I try to make sure those are the things we don’t leave out. Visiting you from the Shine Blog Hop. Great post! My kids are still really young and we’re just starting to build our Christmas traditions. I really like that you included your kids in deciding what you should do as a family. Stopping by From Turn It Up Tuesday. I love holiday traditions. I left most of my childhood holiday traditions behind and started new ones with my daughter and now grandchildren. I did keep one, reading The Night Before Christmas on Christmas Eve. Great Post. Pingback: Turn It Up Tuesday - #65 - Baby Doodah!